This photo of a group of Elm Grove School children was taken c1978-79. Do you recognise yourself here? Or can you identify one of your school friends from those days? If you can help with putting names to faces, please leave a message below. Elm Grove School children: c1978-79. Hi Harry. Well I’m struggling with names here. It seems to be a mixture of the classes in that year. Also definitely earlier than 78/79. Above Jayne I’m sure is Elizabeth Kingsford. Girl in the ballerina outfit looks like Lisa Bissett to me. Boy in the front row on the far left is Richard Howse. Some I just don’t recognise at all. Yes Wayne, it is Lisa Bissett. Still no pic of you I’m afraid!! See I haven’t given up though!! Boy in the white jumper with the conker could be me age 11 – but I’m not too sure. 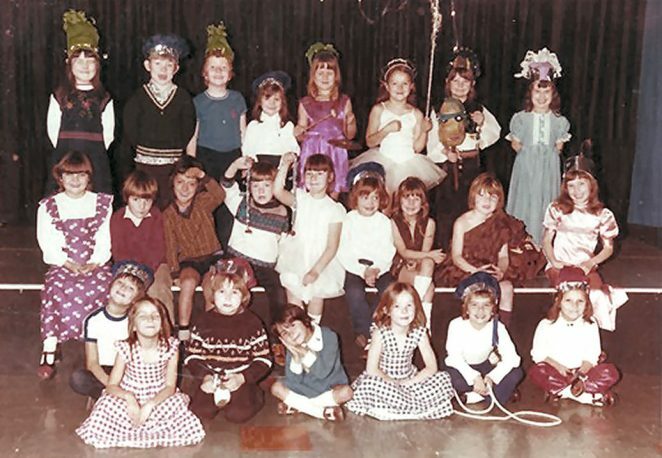 The girl middle row fourth from the right is my sister Sandra Mitchell.